1.2 Why Does Execessive Military Spending Matter? 1.5.3.3 What Is the 5% Threshold Figure? 1.5.5.1 Can We Get Back to Clinton Era Levels? Tipping Point North South Ltd (TPNS) was formed in 2009 and is constituted as a co-operative ‘for the benefit of society’. Its two key areas of work are the support of feature length documentary film and social action campaigning. TPNS trades as Tipping Point Film Fund (TPFF), supporting a small number of films in an executive producing role and works closely on their respective call to action outreach campaigns. Since 2009, two films have been completed and preparing for release, one is fully developed seeking production funding and another is in development. ‘We Are Many’ addresses the illegality of the invasion of Iraq set alongside the power of the ‘99%’ – more than 15 million people in 800 cities in 70 countries marched to protest the imminent invasion of Iraq. And the film also addresses the immense human and financial cost of the Iraq invasion – a toll that continues to rise to the present day, on both fronts, as lives continue to be lost and the financial burden continues to be felt. THESE TWO – WAR SPENDING AND THE POWER OF THE ‘99%’ – ARE ALSO AT THE HEART OF THIS CAMPAIGN PROPOSAL IE HOW TO REDIRECT FROM THE FORMER IN ORDER TO BETTER SERVE THE LATTER. Civil society around the world is challenging the varying degrees of austerity measures being demanded of it by governments and international institutions such as the IMF. Inextricably linked to this, is civil society’s call for increased transparency and accountability on the part of government, business and the financial sector. Military spending – now at a global all time high- should not be exempt from either calls for cuts at this time, nor transparency. There are many and varied existing organisations and campaigns that target a wide range of war/military spend issues – arms trade, arms controls, nuclear weapons and tax resistance through to various campaign calls in the USA to cut their own military budget. It is also unavoidable that this campaign, global in nature, gives great attention to the USA military budget – and by extension – US military reach and influence over the rest of the world’s decision-making on both arms imports and foreign policy. The USA accounts for almost half of all world spending; arms sales and spends more that the next 13 biggest spenders combined. Therefore, this campaign sees enormous power in the combined efforts of progressive policy advocates, campaigners and activists from the USA and the rest of the world combining their strengths to push for cuts to military spending and igniting a serious debate about how much we do (or don’t) know about our taxes and military spending; why we want to divert funds to better use and why the time has come for fresh ideas on what exactly constitutes ‘defence’ to be put into the mainstream. It is the intention that The Five Percent Campaign, focused on its military spending cuts formula, will complement and add value to all existing campaigns. It is also possible that it can help attract some civil society groups in countries and regions that may not, to date, be quite as engaged in the military spending issue as others. Redirecting funds captured from ever-rising and excessive military spending would present a significant ‘new’ revenue stream to deal with such mass social need – the amount spent on weapons and war dwarfs the amount needed to deal with hunger, poverty and education globally. According to the World Bank and the Office of Disarmament Affairs, only about 5% of the amount spent annually on defence would be needed each year to achieve the Millennium Development Goals by 2015. 1 World military expenditure, 2011: $ 1.74 trillion (SIPRI, 2013). World population, 2011: 7 billion (United Nations). The Millennium Development Goals expire in 2015 and the new Sustainable Development Goals are being drawn up. The international development sector is currently looking towards its new agenda, assessing its priorities for the future, and mistakes of the past. It is likely that this dialogue will result in a new approach to development and new international targets that will dominate the development agenda for many years to come. It is therefore essential to ensure that debate about excessive global military expenditure is part of this process. The UK government will decide whether or not to renew Trident in 2016 and potentially offers a key moment around which to work towards to build our coalition for The Five Percent Campaign. On 24th July, 2012, as two hundred and four nations were walking into the Olympic stadium at the culmination of the London 2012 Opening Ceremony, at the very same time in New York, The United Nations was failing to reach agreement on an international arms trade treaty. While the world took a rare moment to celebrate nations coming together under the Olympic banner, the UN’s struggle to sign off on a treaty to regulate the arms trade reflected another truth – a truth suspended momentarily as we watched those 220 flags being carried around the Olympic track – which was that many of those same nations represented at that opening Olympic ceremony would be in conflict, post conflict, arms trading or any combination of the three. Another prism through which to read these figures comes from the Canadian based Centre for Research on Globalization which describes the top spenders as a ‘$1.6 Trillion “Military Mafia”.’ In 2009 NATO countries (the US, Europe and the UK) accounted for 70 per cent of the global military expenditure. Nearly half of the global total was by the US alone. All rogue states, the so-called perceived enemies of the West ie North Korea, Iran, Sudan, Syria, Cuba and Libya, reportedly spent less than one percent of the total global military spending in 2009. Even if we factor in the Chinese defence spending ($70 billion in 2009) and Russian spending ($47 billion in 2009), the total defence spending of all these states (potentially hostile to the US and NATO) came to $133 billion, which is just about nine percent of the global total. This annual global $2trillion military spend (excluding the costs of wars) is also being found from government budgets at a time where cuts to public services are being made the world over. Whether ‘austerity’ is indeed the way out of recession is arguable – however, whatever your position on how we drive our way of recession, military spending should not remain immune from playing its part. While some cuts have been made in some countries (UK included) there remains enormous room for reduction – and re-allocation to better uses, both domestically and globally. Annual military budgets, additional war spending and the arms industry combined, holds a mirror up to the reality of economic and political power as it is protected and reinforced around the world by a very small number of countries. This economic and political power has held ‘good’ for a long time – the northern hemisphere (Europe, North America and Russia) has set the terms of reference for the majority of people on the planet for centuries. Today, this may be felt through interventions, invasions and/or arms sales and still, largely, reflects traditional ‘spheres of influence’ – be it regional, post-colonial or post-cold war. Military budgets, arms procurement and, ultimately, conflict, self-evidently conspire to undermine human and social development. While it is true to say that many conflicts may have their roots in local disputes, it is also true to say that, for the bigger picture, a small number of governments and an even smaller number of defence industry ‘corporates’ set the global agenda in terms of military spending, arms sales and, ultimately, policy decisions (up to and including the decision to go to war). This has the consequence of holding back development- in a myriad of ways – for many countries in the global south and of redirecting taxes from social needs in developed nations. This campaign wants to see military spending added to other sectors of national and international activity that are currently under scrutiny – for example, the finance sector, multinational corporations, sections of the media as well as standards in political representation. There is no reason why military spending should be immune from the same kind of ‘structural’ focus and campaigning that have been applied to, for example, debt, trade, tax, environment/climate and –most recently the ‘war on drugs’ is being included in this list – as a result of a more intense spotlight on it, become more widely integrated into civil society dialogue and activism. Military spending (and by extension the links to the arms industry) does not take place in a vacuum – it is a highly politicised activity that works against the interests of, at the very least, the poorest and, one could argue, the majority of people on the planet (not to mention the planet itself). Military spending already intersects with a number of established and hugely important structural campaigning issues. 38% of Argentina’s debt comes from loans for military equipment. In the late-1970s, the UK government lent the brutal Argentinian dictatorship money to buy two warships, helicopters and missiles, which were later used to invade the Falkland Islands. Only 1% of Iraq’s debt is said to come from military equipment. However, the Scott Report and investigations by journalists have previously revealed that some exports were classified as exports such as construction, which were actually used for activities such as building a chemical weapons factory. The military spend related components of these historic odious debts still impact on the present day and they also give insight into the current relationship between the arms sellers of the north and the buyers of the global south. Wars and conflicts – whether conducted by nations with high tech capability or fought over prolonged periods primarily with small arms – each in their own way contribute to environmental degradation. Water sources get polluted, forests cut down, soils poisoned, and the cost to some wildlife also severe. And then there is the terrible human cost of long-term threats that remain in the wider environment – landmines or depleted uranium; agent-orange or nuclear testing. All of which in turn, only serves further impact on communities that rely on those same resources for their livelihoods and day to day existence. To draw attention to this, in 2001 the UN General Assembly declared 6 November of each year as the International Day for Preventing the Exploitation of the Environment in War and Armed Conflict. Nevertheless, the wars continue to take its lasting toll on the environment and the population; for example, just in a three-week period of conflict alone in Iraq during 2003 it was estimated that nearly 2000 tons of depleted uranium (DU) munitions were used. Particularly in Fallujah, radiological and toxic contamination from DU (and other toxic metals) has caused birth defects at a rate more than 14 times the rate experienced by Hiroshima and Nagasaki. DNA mutations caused by DU can be passed from parent to child. Furthermore, the remaining traces of DU in Iraq will remain radioactive for more than 4.5 billion years. The UN Environmental Programme has found that over the last 60 years, at least 40 per cent of all internal conflicts have been linked to the exploitation of natural resources, whether high-value resources such as timber, diamonds, gold and oil, or scarce resources such as fertile land and water. Conflicts involving natural resources have also been found to be twice as likely to relapse. However, in some cases, simply the business of having an army, contributes to climate change and worse, when taken into war, can massively contribute to climate. The largest by far is that of the US military. During the Kyoto Accords negotiations in December 1997, the US demanded as a provision of signing that any and all of its military operations worldwide, including operations in participation with the UN and NATO, be exempted from measurement or reductions. After attaining this concession, the Bush administration then refused to sign the accords and the US Congress passed an explicit provision guaranteeing the US military exemption from any energy reduction or measurement. This has meant, for example, that the emissions associated with the wars in Afghanistan and Iraq are unreported as they are ‘incurred’ outside the USA and are therefore not captured in the national greenhouse gas inventories that all industrialized nations, including the United States, report to under the United Nations Framework Convention on Climate Change. While official accounts put US military usage at 320,000 barrels of oil a day, that does not include fuel consumed by contractors, in leased or private facilities, or in the production of weapons. The US military is a major contributor of carbon dioxide. The United States Department of Defense is one of the largest single consumers of energy in the world, responsible for 93% of all US government fuel consumption in 2007. In 2006, it used almost 30,000 gigawatt hours (GWH) of electricity, at a cost of almost $2.2 billion. The DoD’s electricity use would supply enough electricity to power more than 2.6 million average American homes. In electricity consumption, if it were a country, the DoD would rank 58th in the world, using slightly less than Denmark and slightly more than Syria (CIA World Factbook, 2006). The Department of Defense uses 4,600,000,000 US gallons (1.7×1010 L) of fuel annually, an average of 12,600,000 US gallons (48,000,000 L) of fuel per day. A large Army division may use about 6,000 US gallons (23,000 L) per day. According to the 2005 CIA World Factbook, if it were a country, the DoD would rank 34th in the world in average daily oil use, coming in just behind Iraq and just ahead of Sweden.The Air Force is the largest user of fuel energy in the federal government. The Air Force uses 10% of the nation’s aviation fuel. The B-52 Stratocruiser, with eight jet engines, guzzles 500 gallons per minute; (ten minutes of flight uses as much fuel as the average driver does in one year of driving). In 2006 the USAF used one quarter of all jet fuel, equivalent to all that consumed by US planes did during the Second World War – an astounding 2.6 billion gallons. PwC’s annual Low Carbon Economy Index report concludes in 2012 that global carbon emissions have to be cut by a rate of over 5% per year from now to 2050 in order to limit the rise the average global temperature to be less than 2 degrees. As the people of the world face the catastrophic consequences of climate change, why is the military exempt from being central to the debate – and strategy – on how we achieve an urgent and drastic cut in the rate of carbon emissions if we are to stop global temperatures from rising more than 2 degrees this century? Citizens for Tax Justice released two reports on the corporate taxes in USA; on both occasions, they found that Boeing paid “paid less than nothing in aggregate federal income taxes” over both the entire 2001-2003 and the 2008-10 periods. Because of huge tax rebates Boeing received, their effective tax rates were -18.8% and -1.8% respectively during these two periods. ‘Negative tax rates’ mean that Boeing made more after taxes than before taxes in those no-tax years.” In the aerospace and defense industry, the average effective tax rate were 1.6% and 17% respectively during the same two periods – much less than the federal corporate income tax rate, which is set at 35%. Boeing and Lockheed, the two largest defense contractors in the world, prove that war is most certainly profitable – in every way. While the US federal corporate income tax rate is 35%, Citizens for Tax Justice in the USA have found that between 2001 and 2003, combined aerospace and defence industries’ profit was $17.7bn, yet effectively they only paid a tax rate of 1.6%. In the same period, Boeing made a profit of $5.7bn, and yet received a tax rebate of $1.1bn. And according to USA based Institute for Policy Studies, Boeing has 38 subsidiaries in foreign tax haven jurisdiction, as of February 2011. Between 2003 and 2007, Boeing alone secured $101billions and Lockheed secured $146bn in Federal (largely Pentagon) contracts. 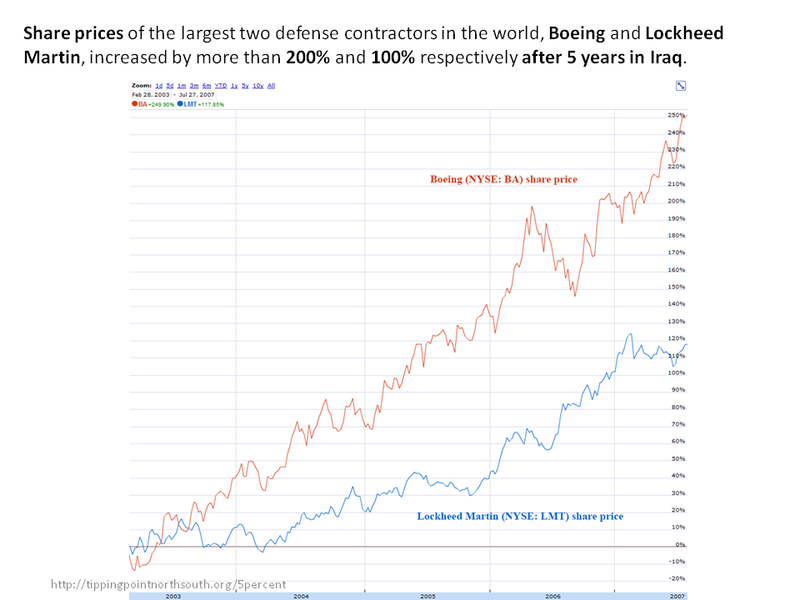 During this same period (eg Iraq invasion years 2003 – 2008) share prices of both Boeing and Lockheed Martin, increased by more than 200% and 100% respectively. The so-called ‘war on drugs’ incurs massive military spending costs for the USA (and by extension also for its ‘allies’ in this ‘war’). Billions of dollars are wasted globally on ineffective law enforcement, undermining international development and security, resulting from an enforcement-led approach that puts organised crime in control of the trade. The Global Commission on Drug Policy, including the former presidents of Switzerland, Colombia, Mexico and Brazil, along with a former U.N. Secretary General, a former U.S. Secretary of State, the prime minister of Greece and the former U.N. High Commissioner for Human Rights, called for the drug war to shift its focus from enforcement and interdiction to medical treatment and harm-reduction policies. The ‘war on drugs’ is deeply intertwined with the ‘war on terror’; while the US/NATO occupation of Afghanistan has cost the coalition hundreds of billions of dollars, Afghanistan has quickly became the world’s first true ‘narco-state.’ After just 5 years since 2001, Afghanistan’s production of opium jumped from a modest 185 tons to 8,200 tons, a remarkable 53 percent of the country’s GDP and 93 percent of global heroin supply. The UK took a lead role in counter-narcotics, and sent troops to Helmand which has been the biggest poppy cultivating province by far. Deployment in Helmand since 2006 has cost £15 million per day. Despite this, the cultivation of opium in Helmand has tripled from 25,500 hectares of land in 2005 to 75,000 hectares in 2012. The drug problem is not going away, and the coalition’s presence continues to cost billions of dollars per year. According to a U.S. Senate report (2011), the Latin American war on drugs has ‘largely failed’. From 2005 to 2009, the majority of counternarcotics contracts in Latin America went to only five major defense contractors: DynCorp, Lockheed Martin, Raytheon, ITT, and ARINC, who collectively received contracts worth over $1.8 billion; many of the contracts were awarded on a no-bid basis. The Department of Defense has spent $6.1 billion since 2005 to help detect planes and boats heading to the U.S. with drug payloads, as well as on surveillance and other intelligence operations. The militarisation and privatisation of the ‘war on drugs’ shows no sign of stopping or even slowing down anytime soon. A long overdue and fundamental re-evaluation of the war on drugs – a ‘war’ started under the Nixon administration – will inevitably have a knock-on effect on the global military spend and will especially impact on both the defence industry and the private military industry. There is every reason to put excessive military spending on the table, in its own right but interlinked with others – along with odious debt, tax evasion, unfair trade, fossil fuels because, like those, it too works against the interests of the populations of the global south; is all too often (ab)used as a tool of trade and/or foreign policy; it also places an excessive financial burdens on citizens at a time when public services are being eroded all over the world. Likewise, by joining the ranks of debt cancellation, financial transaction and other tax related measures, military spending savings should be regarded as yet one more significant ‘new’ revenue stream, redirecting the funds captured to serving the needs of the global community. The graph below shows the intention of the campaign to achieve major reductions (40% over the first 10 years) in global military spending via The 5% Formula. It also shows how spending will rise if we do nothing. To offer up a new, feasible formula for delivering deep, sustainable cuts to global military spending that targets every government on the planet with a fair, proportionate and achievable calculation to reduce their military spend and to redirect savings to address the economic and environmental catastrophe the 99% are facing. To build on the extensive and longstanding policy and campaigning work of the peace movement, across many inter-connected issues; and for this work to be integral to a wide-based, paradigm-shifting international coalition that connects it to development, climate and other relevant policy areas into its activity. To endeavour to grow a global coalition around The 5% Formula with strong, regionally relevant campaigns (ie Europe, USA, Middle East, sub-Saharan Africa, Far East) – yet with the common understanding of how military spending – and the arms industry by extension – is a globalised industry, enforcing the globalised nature of power and economic interests. To change the way the public thinks – and by default – influence the media debate regarding military spending and ‘value for money’: jobs, security, and geopolitical status. Consider that ‘Mumsnet’ could be as useful in this effort as The Guardian. The 5% Formula is a mechanism to achieve major, year-on-year cuts to global military spending over 10 years and beyond. To cut annual global military expenditure by 40% after ten years, back to mid 1990s spending levels ie $1 trillion dollars, the lowest in recent history (and even then, ‘low’ is not low enough for many peace campaigners – indeed far from it). To deliver savings of estimated $700 billion over 10 years redirected to core urgent human and environmental needs. Application of the 5% annual and absolute cuts – to achieve this global 40% cut ($700bn) over the first 10 years. After the first 10 years, we call upon all nations to adopt the 5% threshold rule to sustainably restrain the global military spending – no country allows any increase in military spending to outstrip economic growth. 5% annual and absolute cuts to their national military budgets. This is equivalent to a compound 40% cut for each nation’s respective annual military spending after 10 years (see the Table on the right for illustration). These cuts are expected to deliver an estimated $700 billion in total to be redirected. This 5% threshold rule is designed to be mainstreamed into budgeting beyond the first 10 years, acting as both a military expenditure ‘dampener’ and an economic growth ‘accelerator’ for all nations, while facilitating and enabling the public to more deeply interrogate the many inter-linked issues of the military spending debate. All nations adheres to a ‘5% threshold rule’. The 5% threshold rule in practice means no country allows any increase in military spending to outstrip economic growth. Most economies grow less than 3% annually; this effectively translates as 2% annual reduction to their military spending. These savings are then divided equally to fund both domestic and international needs. The world military expenditure will gradually decrease, until an equilibrium is reached that emphasises economic/social rather than military advancement. The fast-growing economies (eg BRICS), according to this 5% threshold rule, might be able to increase their spending in some years if their GDP growth merits it (albeit at a much lower rate than they might otherwise do without the threshold). In that case, there will be no ‘cuts’ per se to their military spending to be diverted, we propose that they are therefore required to ‘gift’ a contribution of an amount equal to 2.5% of their previous year’s military spending to fund international development programmes. The 5% Formula would therefore drastically cut annual global military spending to the $1 trillion in a short but practical period of time and then maintain an effective check on military spending in perpetuity by considerably lagging its annual change behind economic growth. 2 In many ways, military expenditure hinders rather than advances economic prosperity, compared to investments by the government in other productive areas of the economy. The 5% threshold rule ensures a government allocates more of its revenue to grow the economy while still preserving its ability for sensible defence. 3 Annual GDP Growth is the % difference between any two consecutive years’ GDP: we assume most economies will not grow more than 5% on average for the foreseeable future. 4 This 2.5% ‘contribution’ is a fixed percentage, no matter how negligible the annual military spending is increased. This is consistent with the requirement for Top 20 spenders who are required to cut 5% of their annual military spending every year in the first decade and to divert these savings to fund both domestic and international needs equally – in effect, Top 20 spenders are diverting 2.5% of their annual military spending to fund international development programmes every year. In the 2000s, the world economy’s annual growth was less than 3% on average. The 5% figure is 2% higher than the average economic growth rate of 3% and is therefore a challenge for big military spenders and emerging economies to either cut or pay up. An average yearly cut of 2% is a reasonable long-term, sustainable demand for ALL economies: not a great burden upon existing defence budgets, fair and proportionate for all nations, and yet nevertheless able to deliver a significant sum to divert to more relevant, urgent and sustainable human need. After the first ten years, all nations would collectively maintain this formula into the next decade. Within this Rest of the World group, will be a number of faster growing economies. This category reflects fast growing economies (eg BRICS), and who, according to the 5% threshold rule – might be able to increase their spending in some years if their GDP growth merits it (albeit at a much lower rate than they might otherwise do without the threshold). In that case, there will be no ‘cuts’ per se to their military spending to be diverted, we propose that they are therefore required to ‘gift’ a contribution of an amount equal to 2.5% of their previous year’s military spending to fund international development programmes. It is worth bearing in mind that the levels proposed here are still not as low as military spending budgets during the Clinton presidency, when the world’s biggest spender – the USA – had its smallest military budget since the end of the Vietnam War. However, if the 5% Formula was to be applied over 10 years, we would start to get there. By extension, USA military budget trends (increase or decrease, depending on domestic and foreign policy-making), influences budget trends in the rest of the world. 1.5.5.1 Can We Get Back to Mid 1990s Levels? Global military expenditure reached its lowest point since the peak of the Cold War in the mid-period of Clinton presidency (around $ 1 trillion in 2010 prices). Global military expenditure in 2010 was $1.6 trillion and to get to $1 trillion from this point, expenditure needs to be reduced by 40%. Our campaign goal is to reach $1 trillion in just 10 years. The USA’s military expenditure is now at its historical peak, due to the astronomical increase during the Bush years. Historically, there has always been a significant and steady decrease of military expenditure after a period of over-spending, this has not yet happened during the Obama years. Despite claims to the contrary, previous spending reductions have not compromised U.S. national security or created a hollow military. Why does it matter that the USA gets back to mid 1990s levels? Because the rest of the world is hugely influenced – directly and indirectly – by USA military spending. To reach $1 trillion from the peak of the Bush level, 40% cut in USA’s military expenditure is needed. This 40% cut can be achieved by adopting our demand – cut 5% in military expenditure every year for the next 10 years. Afterwards, USA adopts the 5% threshold rule. This will ensure the mid 1990s level is sustainable in the long term. Many inside (and outside) the USA now argue that the USA itself has to take a lead in tackling their own out-of-control spending. If this is possible, and if it can buy into the value of returning to the mid 1990s levels, the overall global aim of this campaign is achievable. At the time when Greece was on its knees, Germany and France included military sales as part of the bailout package conditions. The business of military spending, (and in this regard, the line between government and defence industry activity is a very blurred line indeed), whether domestic or as part of arms deals, is more about contracts and profits than ‘defence of the realm’. The Arab Spring, the Indignadoes, Occupy movements and UK and USA Uncut are all part of the global call to assert a new progressive set of values. Hugely inflated military spending budgets are a major part of the problems we face today – they too must be more prominently factored in to its contribution to global inequality and climate change. We believe that this international campaign, and its 5% Formula allows every nation – relative and proportionate to its economic growth and GDP – to share in ‘sensible’ defence budgeting with the long term effect also acting as a dampener on arms races. In the last ten years, the world economy grew by roughly 2.5% per year on average but global military expenditure increased on average by around 4% annually. Military spending is one of the least efficient ways of investing our limited resources to advance economic growth and prosperity; thus, the significant outpacing of its increase to the economic growth is harmful to the real economy and consequently the society. While in good years, some countries may have fast growing economies and may divert some of this growth to fund further military expenditure, the 5% threshold rule will prevent them increasing military spending as fast and as much as they would have done, based on historical precedents. On the other hand, when the economy is in distress – and many countries are experiencing this -, the rule will ensure that countries spend their taxpayers’ money wisely and focus on economic growth and social welfare by cutting costly, unaffordable and often unnecessary military expenditure. The need of this automatic diversion of public spending from the economically unproductive defence spending to other productive areas is especially apparent in the current time of the global recession. If – as we hope – we can extend the initial proposed first 10 year framework, then the global public could call upon their governments to continue a sustainable downward trend in military expenditure, saving further monies for constructive reallocation to areas of greater human need. This campaign concept is fair, proportionate, just – and long, long overdue. It speaks to a multi-polar world where reduced military spend equates to a safer world and where the notion of non-offensive defence and sustainable security are a powerful combination in this 21st century.